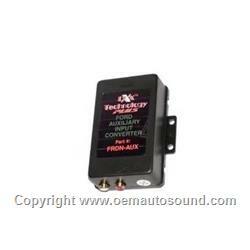 Mazda auxiliary input interface for tribute and b series truck. Radio must have external CD-changer controls press CD button twice and it will display "NO DJ, NO CD" audio input interface will allow you to input audio if not the Oem Mazda radio, you can use this for any portable audio source iPod, iPhone, or Mp3 player. Radio must have external CD-changer capabilities. Connects to 20-pin connector at head unit.